Usually when we talk about BUFFET, the first thought that comes to our mind is FOOD! And the second thought is EAT ALL YOU CAN! Ok this time we do it the different way. Now we are talking about FASHION! And the second thought is GRAB ALL YOU CAN! This sounds exciting at the same time scary. 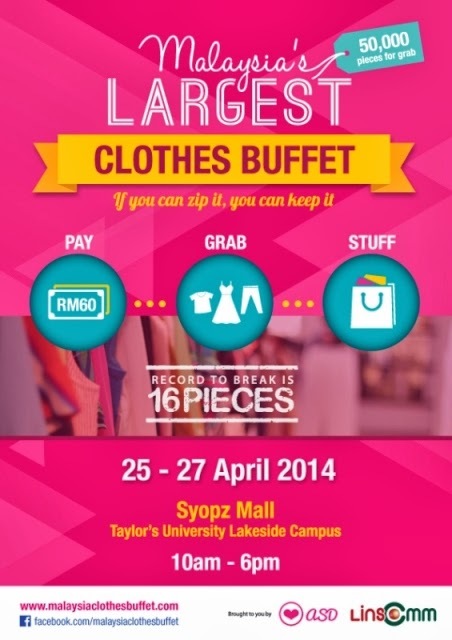 You know lah when come to shopping, we forgot everything around us hehehe… Malaysia’s Largest Clothes Buffet 2014 Is Coming to town. 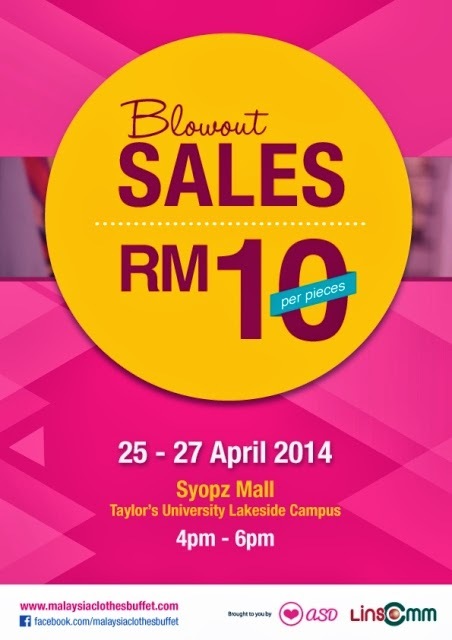 To all the young and hungry fashionista you are going to go through a unique shopping experience at Malaysia's Largest Clothes Buffet happening from 10am - 6 pm on 25-27th April 2014 at Syopz Mall, Taylor's University Lakeside Campus. Organized by LINs Communication and A Shopaholics Den, this event aims to bring shopping to a whole new level without breaking the bank. 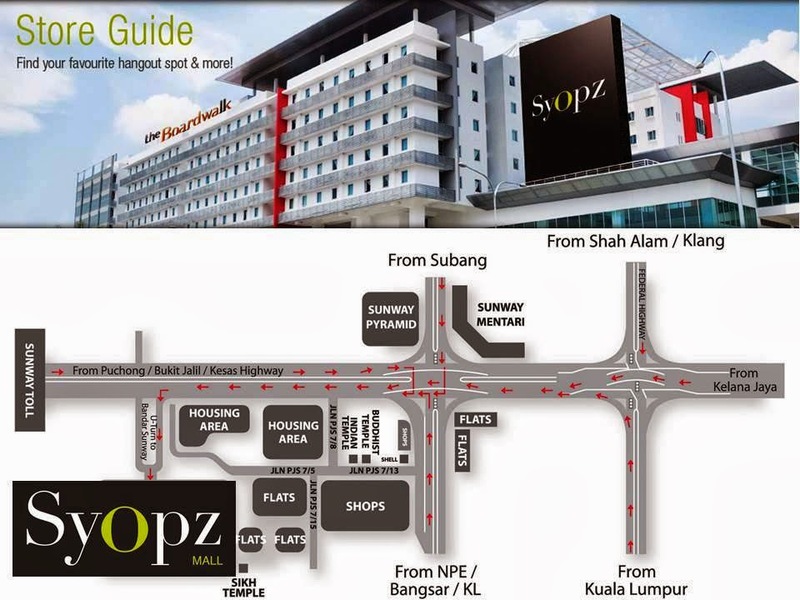 You will have access to a whopping 50,000 pieces of fashionable pieces in the buffet area which they can enter with a fee of RM 60. Each will receive a ziplock bag and be allowed to grab as many pieces as they can in 15 minutes. 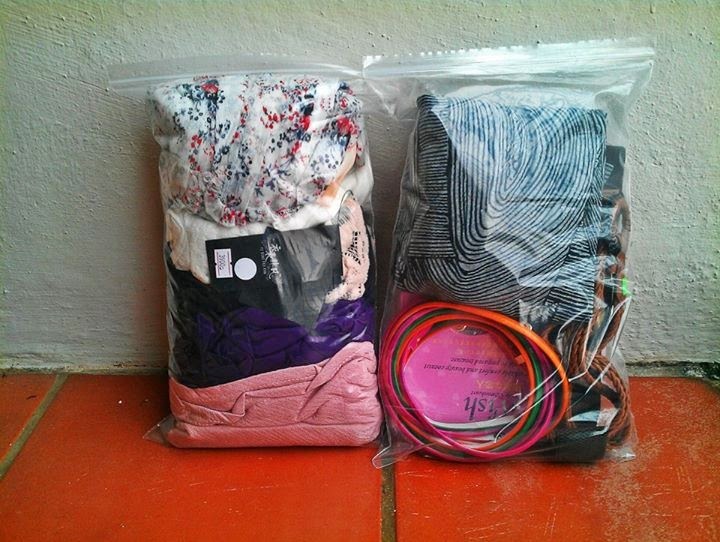 As long as you can fit the clothes into the ziplock bag and zip it, it is yours to bring home ~ If you can zip it, you can keep it. Any idea...When is the next buffetr clothes to be held? thanks..